The designers have decided to make the base of the Interior the right proportions and elements of Classicism, but along with this have chosen unusually light, almost monochrome color scheme. The bedroom in the Classic style has acquired airiness and refinement, but also supplemental exclusive features which have served to create the magnificent Interior in opal colors and to turn an ordinary room into a space for rest and relaxation in the elegant splendor. Often talking about Classic-style interiors, the main attention is focused on basic elements, strict geometry. But, certainly, the rich opal color has become a special feature of this room. It has become the basic thread, on which all the other decorative elements have been threaded. The result has exceeded expectations. The light, like saved by the centuries, Interior has combined the best traditions of Classic-style rooms of the past: gold of stucco moldings, artistic parquet, exclusive furniture, made by the best craftsmen, light and at the same time attractive light fixtures. 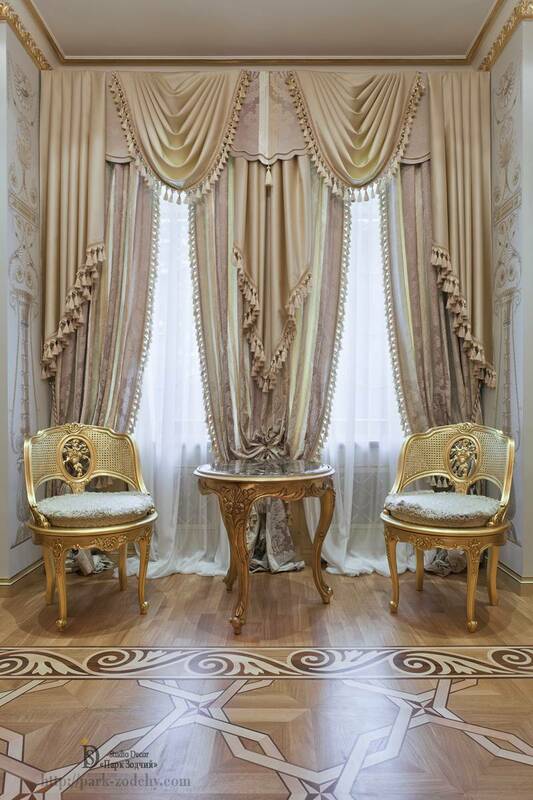 Gilded furniture parts, night lamps, wall-mounted lamps and stucco moldings, Royal wallpapers create a harmonious space. They are not ”arguing” with each other and are the status complement to life. 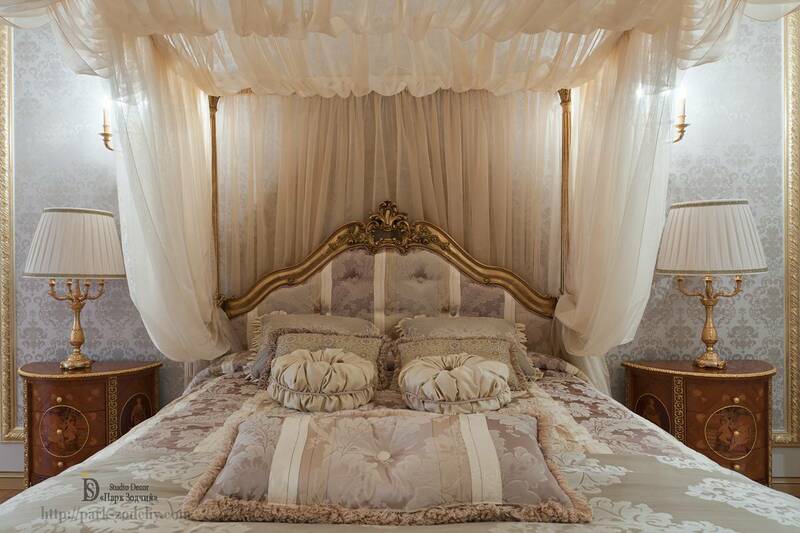 Boudoir luxury is given to the bedroom by the large bed with the canopy, which folds softly frame the bed. Night lamps on the stylized bedside tables with the decor in the form of meander, decorative pillows, satin bedspread, bed headboard complement the excellent composition. Unusual lighting effect is given by wall-mounted lamps, they create soft glow. The room is shrouded in “fog” of light chiffon, which gives a feeling of pre-dawn morning freshness. The wallpapers with proportional report in light colors, framed by thin rods covered with gilding create an interesting spatial effect. They, with using light fixtures, change the view of the true size of the room. Design of stucco molding has allowed changing the geometry of space and outline the silhouette of furniture. Ornamental grisaille painting of the bay window is in harmony with color tones of the wallpapers, wonderfully complements it and does not create imbalance in the room. The overall concept of the airspace has been maintained perfectly. The parquet pattern is extremely active, but it is completely appropriate in the monochrome Interior, in which there is no large abundance of active color spots. The geometrical pattern of the main field is harmoniously diluted by the frieze with a plastic classic-style pattern, which in turn echoes with soft textile fails, canopy and flowing lines of furniture. The bedroom decor in opal colors was created not to hit somebody’s fancy, but for the comfort and convenience for the particular family, which is why it has turned out to be harmonious, comfortable and exquisitely aerial.